Capetonians can look forward to a bigger and better ‘celebration of beach culture’ when the seventh edition of the Earthwave Beach Festival is run at Muizenberg on the weekend 26 & 27 September. Along with the popular attempt to improve the Guinness World Record for the ‘most surfers riding the same wave’, the beach and surf activities for the whole family and the talks and displays on sustainable lifestyles, this year’s event has been expanded to include a colourful attempt to set a new world record for the ‘largest bikini parade’ and live entertainment, exhibitions, food sales and a beach bar in the Pavilion on the water’s edge overlooking the action. Kahuna Promotions, founders of the Earthwave concept and holders of the record for the ‘most surfers riding the same wave’ (110 recorded at Earthwave in 2009), have joined forces with outdoor festival experts, GoodTimes Events, to take the entertainment, exhibition, sales and food offerings to new heights this year. The reaction to the announcement of the event has been overwhelming. Over the past week the Facebook event page has reached nearly 180 000 people, more than 3 600 of whom have already indicated that they will be attending the festival. Enquiries are flooding in from those who want to participate in the surfing and bikini record attempts, display and sell their environmentally friendly goods and services, provide and attend the entertainment and volunteer to assist in running the festival activities. Early adopters eager to take advantage of the marketing and sales opportunities provided at the festival are as diverse as Rafikis Restaurant and Bar, the Kingii personal inflatable safety device and the Pole Yard timber products. UBER have offered all first time users a Free trip to the event to the value of R200 if they sign up at uber.com/app with the code Earthwave 2015 while a platform for fast, efficient communications with participants, celebrities, staff and sponsors has been supplied by BulkSMS.com. To reduce the carbon footprint of the festival and alleviate parking problems negotiations are in progress with Metrorail to provide additional security on all trains to and from Muizenberg station, which is situated right inside the festival venue, on Sunday 27 September. And the organisers are researching options for renewable energy solutions to power the PA systems and other electrical requirements. The entertainment programme is nearly finalised and will be released shortly along with details of the unique pre-event online registration system for participants in the record attempts which is designed to streamline the onsite signup procedures on the day. Earthwave will continue to support worthy causes and a share of the revenue from the festival will be donated to the Dare to Share charity that does so much to assist those in need and the NSRI whose admirable efforts keep ocean users safe. The official digital media partner is www.Wavescape.co.za whose wave and weather guru Steve Pike will be official forecaster for the event. 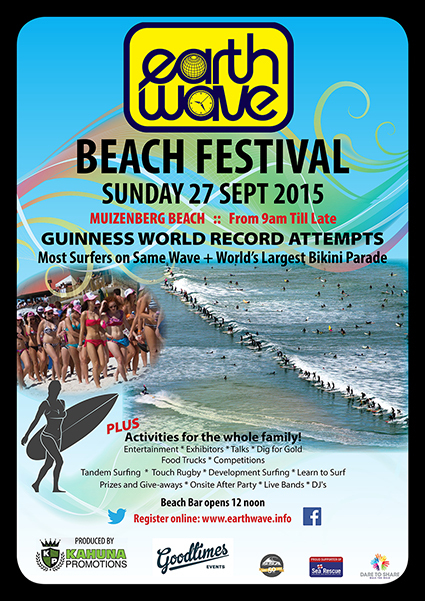 The Guinness World Records for the ‘Largest Bikini Parade’ and the ‘Most Surfers on the Same Wave’ will be challenged when the seventh edition of the Earthwave Beach Festival is held at Surfers’ Corner in Muizenberg, Cape Town on the weekend 26 and 27 September. This popular annual celebration of the beach lifestyle features a host of wave-riding and beach activities, a Beach Bar and entertainment, including local live acts, and exhibitions, demonstrations and talks to promote environmentally friendly products and services, sustainable lifestyles and to raise awareness and funds for worthy causes. “We’re very happy to announce that an attempt to break the Guinness World Record for the ‘Largest Bikini Parade’ has been registered at the 2015 Earthwave Beach Festival’ says Paul Botha from the organisers Kahuna Promotions, who co-founded the Earthwave concept with his son Dene. 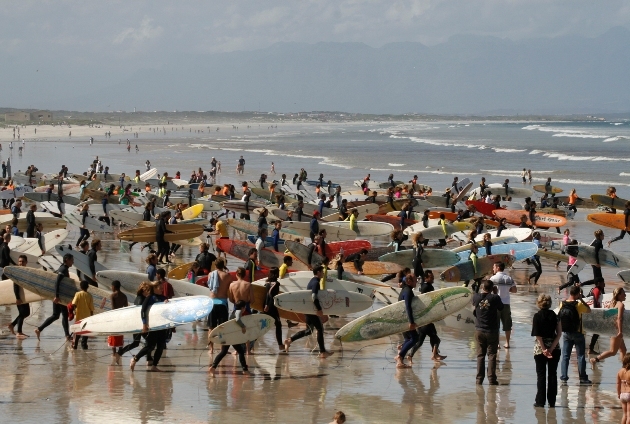 “We’re confident that the enthusiastic Cape Town beach community that has enabled us to set and retain the world record for the most surfers on the same wave since 2006 will also support this attempt to claim the bikini parade record,” he added. The record for the bikini parade has grown from 331 in the Caymen Islands in 2010 to 357 on Australia’s Gold Coast in 2011, 450 in Florida, USA, in March 2012 and currently stands at a massive 1 085 girls who paraded for 1.6 kilometres (one mile) in Huludao City, China in July 2012. 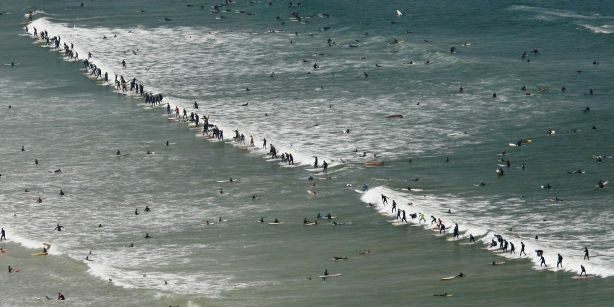 Despite several attempts to improve on the numbers of surfers riding the same wave in Brazil, Holland, California, Australia and England in recent years, that record still stands at 110 set in the gentle rolling waves at Muizenberg during the 2009 Earthwave Beach Festival. In addition to the record attempts the surf will be alive with the hundreds of participants in the Western Cape Development Surfing Championships, Stand Up Paddling (SUP) races and free learn to surf lessons while the beach is the venue for touch rugby, demos of the latest wave-riding equipment and the popular Dig For Gold competition where youngsters search for dozens of valuable prizes buried in the sand. Exhibits and sales of ecologically sound products and services, beachwear and equipment, talks by experts on sustainable lifestyles, surf movies, the Beach Bar and entertainment will be housed in the Muizenberg Pavilion right on the water’s edge overlooking all the action. Near gale-force South East winds, known as the Cape Doctor because they clear all traces of air pollution, forced organisers to abandon the planned attempts to break Guinness World Records for surfing and touch rugby at the sixth edition of the BOS Earthwave Beach Festival over the weekend. 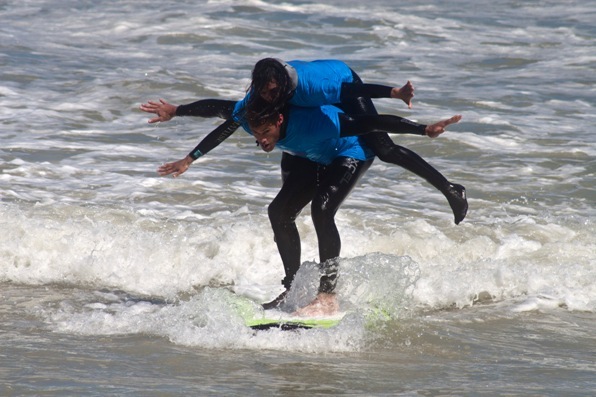 Despite ideal conditions and the enthusiastic support of a packed beach, the Cape Town surfing community fell short in their attempt to break the Guinness World Record for the ‘most surfers riding the same wave’ at the BOS Earthwave Beach Festival at Muizenberg on Sunday. 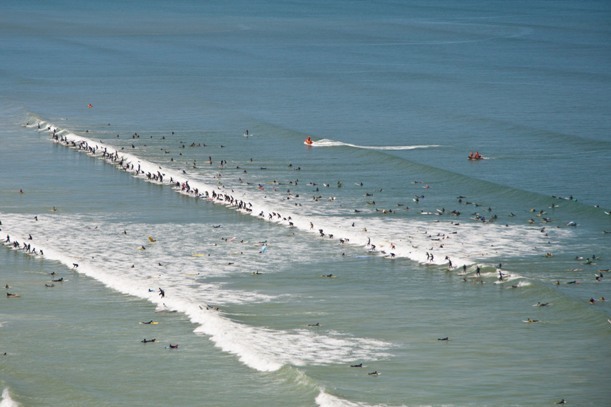 More than 300 surfers of every age and ability paddled out in brilliant sunshine, a gentle offshore breeze and waist to shoulder high waves with great expectations of beating the record of 110 set at Earthwave 2009. After an hour and seven attempts, the best tally posted on the day was 84. 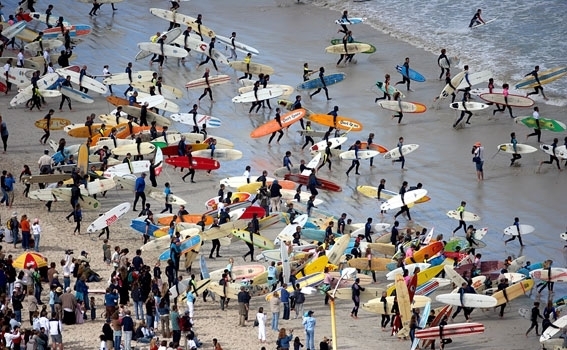 The fifth edition of the two-day festival of beach and surf culture that uses the interest surrounding world record attempts to generate awareness of sustainable lifestyle choices was the best to date. 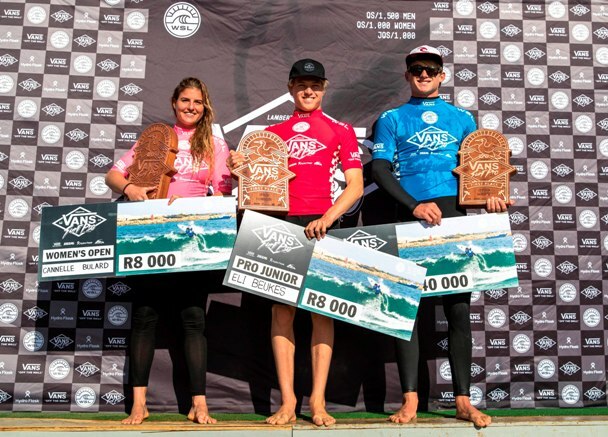 Champions were crowned in provincial schools and longboard surfing and, for the first time in this country, in tandem surfing. 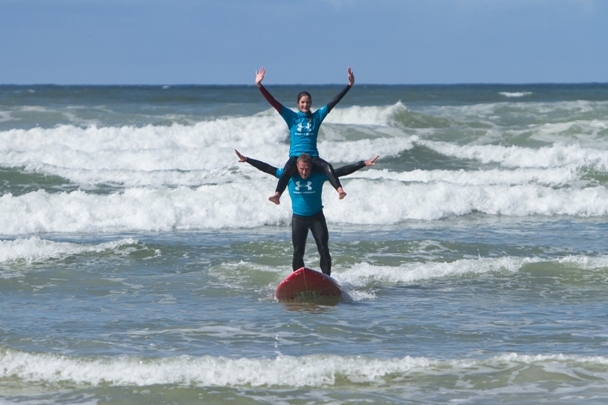 There was also a touch rugby tournament, a stand up paddle (SUP) race to Kalk Bay and back and an attempt to set a world record for the longest line of surfboards on a beach’. The sports events were staged alongside talks and presentations on environmental topics, free testing for various medical conditions, the BOS Dig for Gold treasure hunt and fund-raising for the Sunflower Fund and Shark Spotters program. The festival concluded with an after-party at the Brass Bell in Kalk Bay on Sunday evening where comedian Mark Sampson, SA’s funniest surfer, and live music act Paul & Stef entertained the revelers and the official result of the Guinness World Record attempt, based on photographic evidence, was announced. For the latest information of the BOS Earthwave Beach Festival go to www.facebook.com/BOS.Earthwave or www.kahunasurf.co.za where you will find information on the program of events, images and videos. Follow the activities on Twitter @BOSEarthwave. The BOS Earthwave Beach Festival is produced by Kahuna Promotions and supported by People’s Post and Wavescape.co.za, the official print and digital media partners respectively, and Corner Chat. The surfing events are sanctioned by Surfing South Africa (SSA), the national controlling body for the sport.